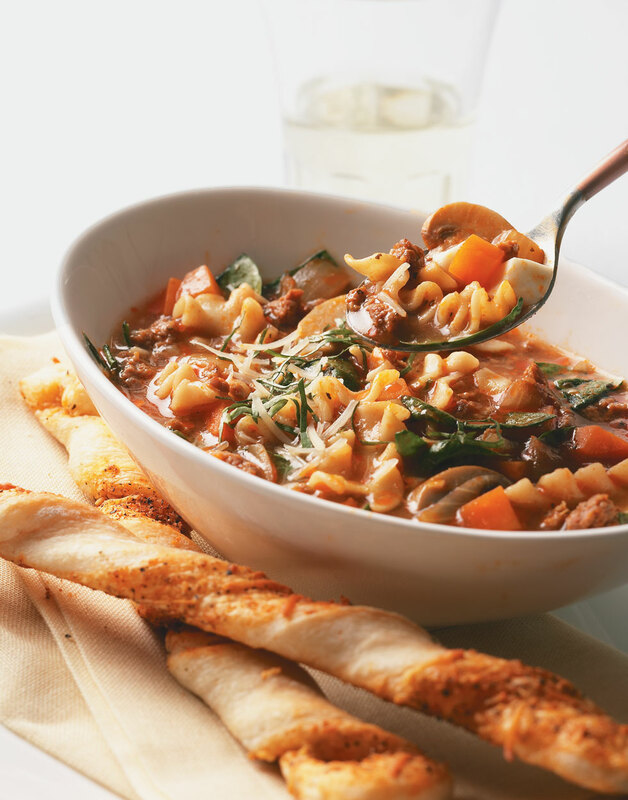 This Lasagna Soup tastes just like its seven-layer cousin, but it takes half the time and a fraction of the work. It’s perfect for a weeknight warm-up amidst the busy holiday season. If you have trouble finding mini lasagna noodles (mafalda), campanelle or penne pasta are great substitutes in the lasagna soup. Brown sausage in a large saucepan over medium-high heat. Add onions and carrots; sauté 3 minutes. Stir in mushrooms and garlic, and sauté 3 minutes more. Add broth, stewed tomatoes, and tomato sauce, and bring to a boil. Stir in pasta and cook according to package directions, about 10 minutes. Stir in spinach and cook until wilted. Place ¼ cup diced cheese in each of four serving bowls; ladle soup on top. Top each serving with Parmesan and basil. Sauté the sausage, onions, and carrots, then stir in and sauté the mushrooms and garlic. Add the broth, stewed tomatoes, and tomato sauce. Bring soup to a boil before stirring in the pasta. Ladle soup over cheese to soften. For the best melting, let stand briefly before serving.